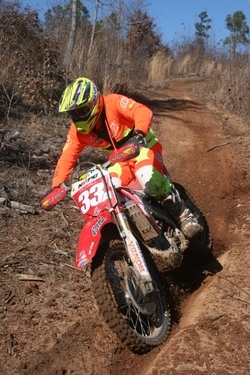 Round 1 of the Rekluse AMA National Enduro Championship was held last Sunday near Greensboro, GA. Team Shenandoah Honda/USWE-sports.com was anxious to get the season started and decided to field a Honda CRF 250 for the expected tight woods. Cold temperatures at the nine o'clock starting time made most riders ride with an extra jacket or vest. With some rain leading up to event, the traction was good with a few small mud holes and it turned out to be a very good course. The first section was a very promising one for team Rider Thad DuVall with a 3rd place. The second test he finished in 6 th place putting him in 4th after two test. Soon into the third test, rear break fluid started to leak and DuVall had to ride most it the third section without brakes, resulting in loosing an extra 4 minutes on the direct competition. Determined to make up some time, he finished the last 3 sections in 4th, 5th and 8th place, resulting in a 10th place Overall. Duvall: "I had fun today, the traction was great. The trail had a good flow to it and I was doing well until my brakes stopped working. The 250 felt light and performed good overall." The team likes to thank all sponsors for their support and will start preparing for round 2 of the National Enduro series in South Carolina.